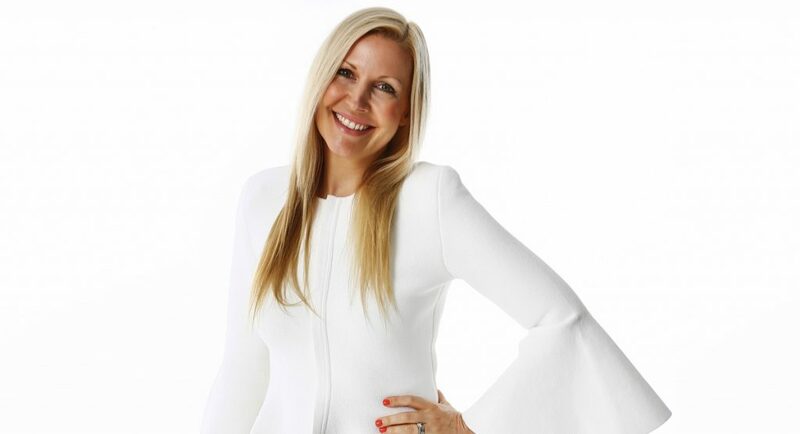 The Healthy Mummy CEO and founder Rhian Allen joins Mediaweek’s James Manning live from 2.30pm today. Hear how Australia’s largest parenting site grew to a monthly audience over 900,000 and annual revenues of $22m. Mediaweek editor James Manning looks at the second radio ratings survey for 2018 in Sydney, Melbourne, Brisbane, Adelaide and Perth. Despite Alan Jones slipping 1.2 points, he continues to lead by a considerable margin. KIIS FM is 2.0 points behind, which is as about as close as anyone has ever got to the master. Drive with Ben Fordham was the only show not to slip a little, although his share of 8.0% is the station’s lowest. The biggest dip was in evenings after 7pm where Ross Greenwood and Steve Price share the audience. Although share was down 2.8, they still command a market-leading 14.2%. See the station-by-station analysis for Sydney here. No one anywhere near these breakfast champs again. All other dayparts were steady or in growth. Evening, which is shared by Ross Greenwood, Steve Price and Phil and Simon, was up 1.1 to 15.1%. See the station-by-station analysis for Melbourne here. After trailing Nova by just 0.5 in survey 1, 2018, 97.3 has added 0.8 and moved ahead of a falling Nova this survey. Breakfast now sits at equal #1 alongside Hit 105 with Nova pushed to third place. 97.3 daytime listening went over the top with morning up 2.8 to 14.6% and afternoon jumped 1.6 to 13.9%. The new Will and Woody drive show managed to hold over 12% too, ranking #2 FM in a market of four. Demos were steady except 55-64, which leapt 4.1 to 18.8%. See the station-by-station analysis for Brisbane here. The numbers dipped ever so slightly but still the third-best Mix result in over two years. Daytime is still off the charts with Michelle Murphy in control from 9am until 3pm and pulling the same sensational shares her namesake at Mix used to – Sean Craig Murphy. Will and Woody remain #1 drive although share dipped slightly from 15.2 to 14.1%. See the station-by-station analysis for Adelaide here. See the station-by-station analysis for Perth here. 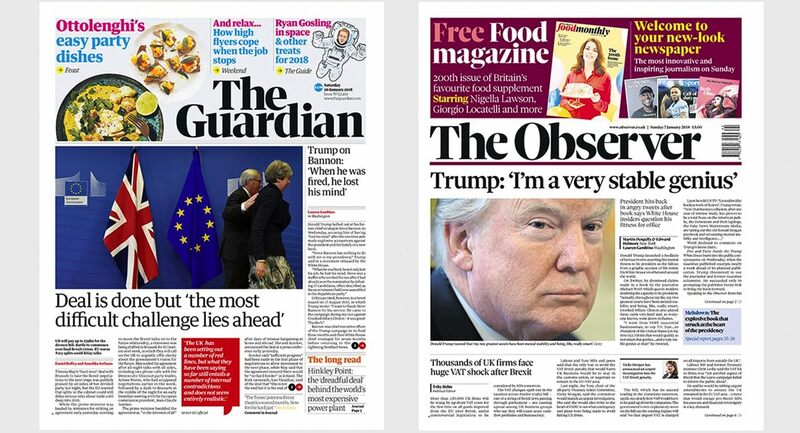 The publisher of the Guardian and Observer halved its losses in the last financial year, and the company is on track to break even this year, the global publisher has reported. Guardian News & Media (GNM) reported a £19m loss in the year to the end of March, in the previous financial year. 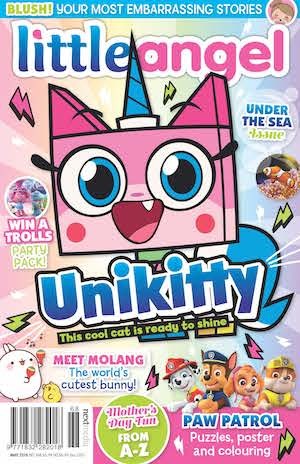 The publisher, which is now in the final year of a three-year plan to break even, has cut losses to a third of the £57m reported when the drive to reshape the business began. GNM’s £19m loss is 25% better than its internal target of £25m, due to a combination of better-than-expected revenue growth and almost £20m removed from the group’s cost base. The publisher cut costs by 7% year-on-year from £252m to £235m. 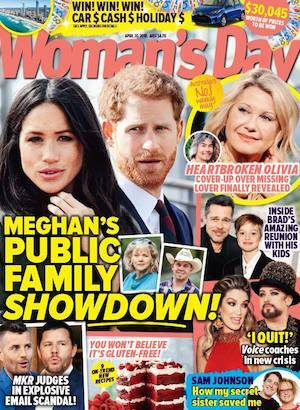 The reduction includes the shift to a tabloid format in January. Total revenues increased marginally by 1% to £216m, a second consecutive year of growth in the face of tough market conditions for publishers. More than 800,000 people now financially support the Guardian, up 200,000 from a year ago. Of these about 200,000 are print or digital subscribers, more than 300,000 are members or regular contributors, and more than 300,000 gave one-off contributions. Reader revenues, including income from the sale of the Guardian on newsstands, now exceed revenues generated from advertising. “We have achieved very rapid growth in our reader revenues – contributions, membership and subscriptions – across the UK, US, Australia and the rest of the world,” said Viner and Pemsel. The Guardian’s US and Australian operations performed strongly over the last year. Guardian Media Group incurs additional costs meaning that the overall loss is likely to be about £24m to £25m when the group officially reports its annual results later this year. In the previous financial year GMG reported a £45m loss. 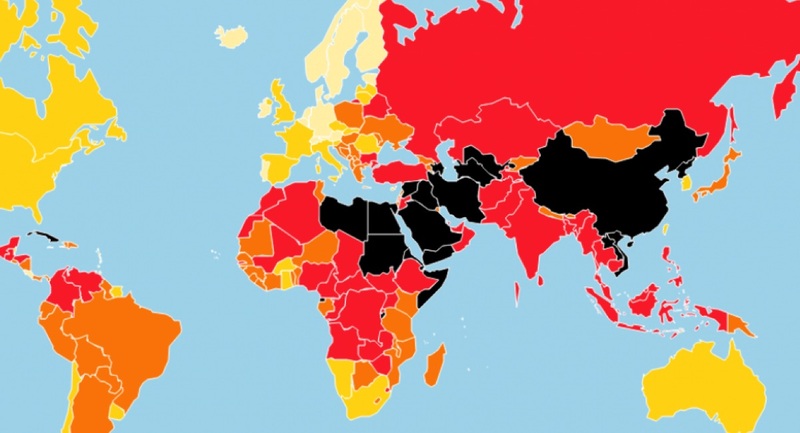 The 2018 World Press Freedom Index, compiled by Reporters Without Borders (RSF), reflects growing animosity towards journalists, says RSF. For the second successive year, Australia has ranked at #19 on the Index. RSF reported that media freedom thrives in New Zealand, with the country jumping five places on the Index from #13 in 2017 to #8 this year. Hostility towards the media, openly encouraged by political leaders, and the efforts of authoritarian regimes to export their vision of journalism pose a threat to democracies. The climate of hatred is steadily more visible in the Index, which evaluates the level of press freedom in 180 countries each year. Hostility towards the media from political leaders is no longer limited to authoritarian countries such as Turkey (down two at 157th) and Egypt (161st), where “media-phobia” is now so pronounced that journalists are routinely accused of terrorism and all those who don’t offer loyalty are arbitrarily imprisoned. More and more democratically elected leaders no longer see the media as part of democracy’s essential underpinning, but as an adversary to which they openly display their aversion. The United States, the country of the First Amendment, has fallen again in the Index under Donald Trump, this time two places to 45th. The line separating verbal violence from physical violence is dissolving. In the Philippines (down six at 133rd), President Rodrigo Duterte not only constantly insults reporters but has also warned them that they “are not exempted from assassination”. In India (down two at 138th), hate speech targeting journalists is shared and amplified on social networks, often by troll armies in Prime Minister Narendra Modi’s pay. In each of these countries, at least four journalists were gunned down in cold blood in the space of a year. Verbal violence from politicians against the media is also on the rise in Europe, although it is the region that respects press freedom most. In the Czech Republic (down 11 at 34th), President Milos Zeman turned up at a press conference with a fake Kalashnikov inscribed with the words “for journalists”. In Slovakia, (down 10 at 27th), then-Prime Minister Robert Fico called journalists “filthy anti-Slovak prostitutes” and “idiotic hyenas”. A Slovak reporter, Ján Kuciak, was shot dead in his home in February 2018, just four months after another European journalist, Daphne Caruana Galizia, was killed by a targeted car-bombing in Malta (down 18 at 65th). In this year’s Index, Norway is first for the second year running, followed – as it was last year – by Sweden (2nd). 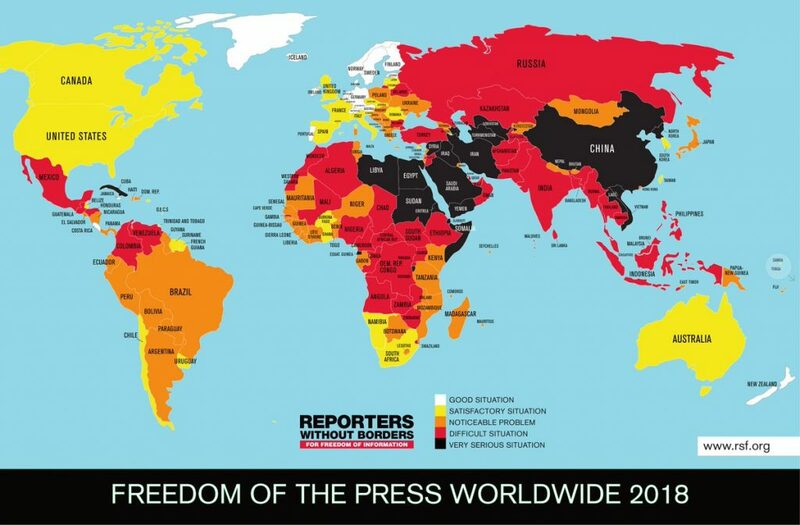 Although traditionally respectful of press freedom, the Nordic countries have also been affected by the overall decline. Undermined by a case threatening the confidentiality of a journalist’s sources, Finland (down one at 4th) has fallen for the second year running, surrendering its third place to the Netherlands. At the other end of the Index, North Korea (180th) is still last. The Asia-Pacific region still has the world’s worst violator of the freedom to inform: North Korea (180th). The recent widespread adoption of smartphones in North Korea has unfortunately been accompanied by draconian control of communications and the national intranet. The state news agency KCNA is the only authorised source of news for all of the country’s media. Just reading, viewing, or listening to a foreign media outlet can lead to a spell in a concentration camp. The global recorded music market grew by 8.1% in 2017, its third consecutive year of growth since IFPI began tracking the market in 1997. Figures released today in IFPI’s Global Music Report 2018 show total revenues for 2017 were US$17.3 billion. 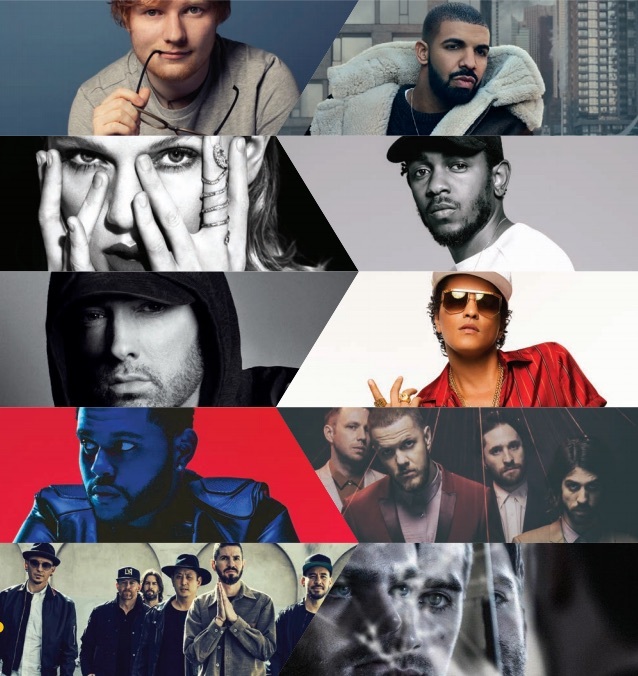 The annual music report also revealed the world’s most successful recording artists and lists of the biggest singles and albums. 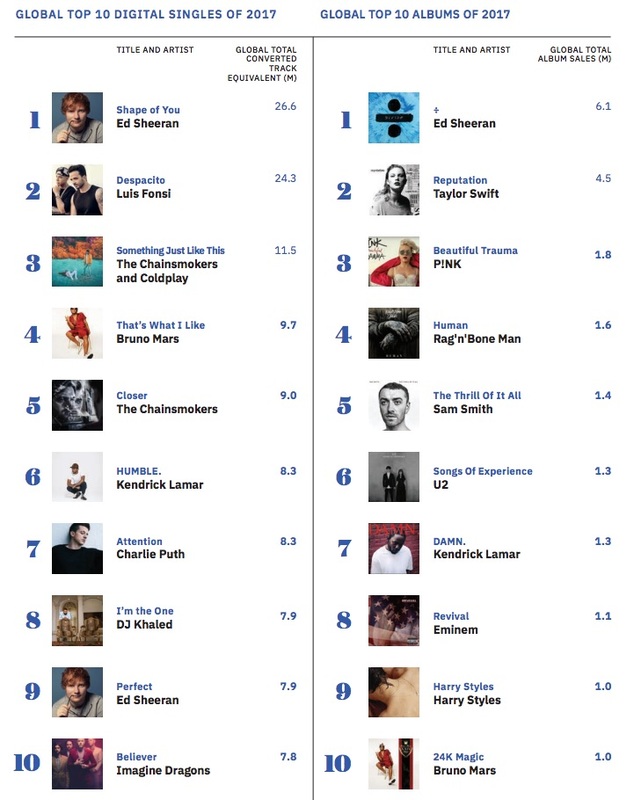 No surprise that Ed Sheeran ranked #1. 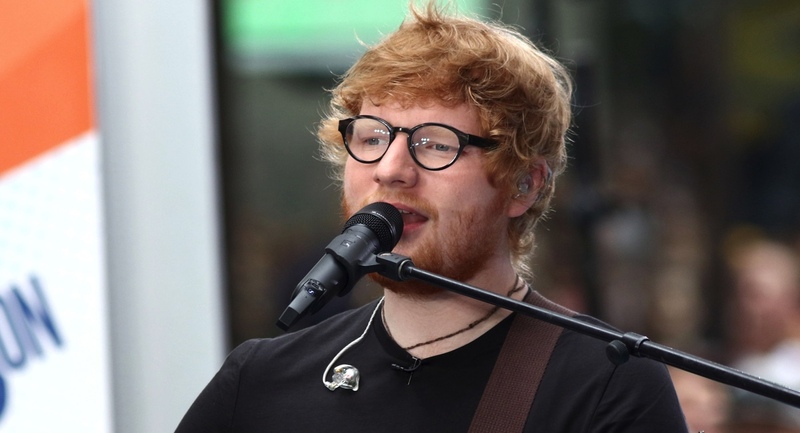 Sheeran’s album “Divide” sold 6.1m units in 2017, well ahead of Taylor Swift’s “Reputation” at #2 with 4.5m. Streaming remains the main driver of recovering revenues and, for the first time, has become the single largest revenue source with 176 million users of paid streaming services contributing to year-on-year streaming growth of 41.1%. Streaming now accounts for 38.4% of total recorded music revenue and its growth has more than offset a 5.4% decline in physical revenue and a 20.5% decline in download revenue. Total digital income last year accounted for more than half of all revenue (54%) for the first time. The industry’s third consecutive year of global growth follows 15 years of significant revenue decline. Despite the recent uplift, revenues for 2017 are still only 68.4% of the market’s peak in 1999. Record companies are working to fuel this recent return to growth, driven by their ongoing investment, not only in artists but also in the digital innovations that are enriching the experience of music fans all over the world. Beyond their efforts to nurture and break artists, record companies have also worked to foster growth in developing markets and have invested in the systems to deliver, manage and track the global distribution of music. Their partnerships are creating engaging ways for fans to access music on multiple services and platforms. This contributed to Latin American revenues growing by 17.7% and Asia and Australasia growing by 5.4%. Comcast Corporation has made a superior cash proposal to acquire Sky. Sky is a leading consumer entertainment company in Europe, providing entertainment and communications services primarily in the UK, Germany and Italy. Comcast said the bid would bring attractive financial benefits to Comcast shareholders, and is expected to be accretive to Comcast’s free cash flow per share in year one. “We think Sky is an outstanding company. It has 23 million customers and leading positions in the UK, Italy, and Germany. Sky has been a consistent innovator in its use of technology to deliver a fantastic viewing experience and has a proud record of investment in news and programming. It has great people and a very strong and capable management team,” said Brian L Roberts, chairman and CEO of Comcast Corporation. When Twitter posted its first quarterly profit a few months ago, many wondered if the result was a one-off or a repeatable feat, reports The New York Times. The social media company answered on Wednesday with its latest quarterly earnings that showed it was still on an upswing. For the first quarter, Twitter reported a profit of $61 million and said revenue rose 21% to $665 million. User numbers rose slightly to 336 million per month. The results surpassed the expectations of financial analysts, and show that even as regulators worldwide turn a more sceptical eye toward social media companies like Twitter and Facebook over privacy concerns and for not doing enough to prevent the spread of misinformation and hate speech, their core advertising-driven businesses are in good shape. Viacom on Wednesday reported better-than-expected fiscal second-quarter earnings as its film unit returned to a quarterly profit, reports The Hollywood Reporter. 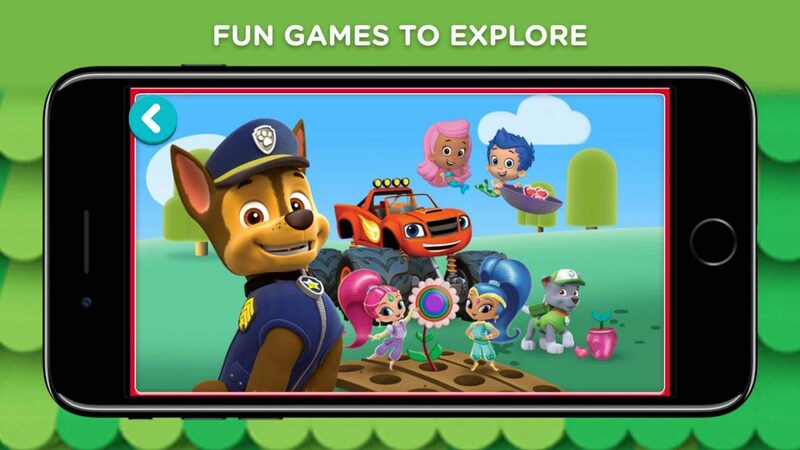 Revenue also beat estimates in the company’s latest financial report that Wall Street will dissect for signs of how the turnaround strategy – unveiled more than a year ago by CEO Bob Bakish and focused on six flagship brands – is playing out. As expected, Bakish and other Viacom execs declined to take questions on the CBS merger talks from analysts during a morning conference call. Instead, they talked up Viacom’s turnaround strategy and its apparent success. On the TV side, the Viacom head touted the media giant’s prospects at the upcoming Upfronts. “Supply will be tight, very tight. 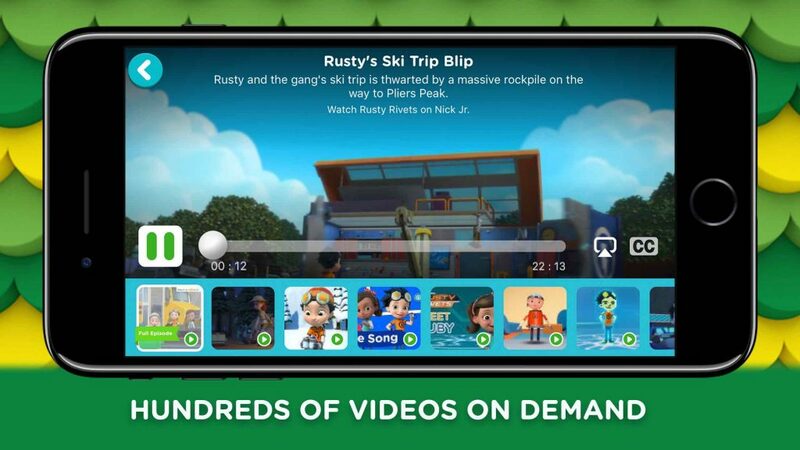 That, combined with the fact we’re seeing very strong scatter pricing, suggests the Upfronts will be strong, particularly as related to pricing,” Bakish said. Viacom’s media networks unit, as expected, again posted a US advertising revenue decline, of 3%, but worldwide ad revenue was unchanged from the year-ago period, as was distribution revenue. Ratings at the company have been impacted by a decline in overall pay TV subscribers, but MTV and BET continued to grow their ratings in the latest quarter. A junior lawyer, who allegedly stole more than $10 million from media mogul Bruce Gordon, lost most of the money on sports betting, reports The AFR’s Misa Han. Brody Clarke is facing a civil claim from Gordon’s companies Birketu and WIN, which claim he stole $10.9 million while working as a lawyer at high-profile law firm Atanaskovic Hartnell Lawyers. It is alleged Clarke fraudulently instructed Deutsche Bank to set up a $7 million loan facility with Birketu and transfer the money into his personal Westpac bank account. On Tuesday, Justice Peter Garling of the NSW Supreme Court issued a temporary order asking Westpac and Sportsbet to transfer the money that is left over in Clarke’s accounts to the court, to be distributed according to future court orders. The Daily Telegraph went retro with its Anzac Day front page to show readers how the news would have looked a century ago. 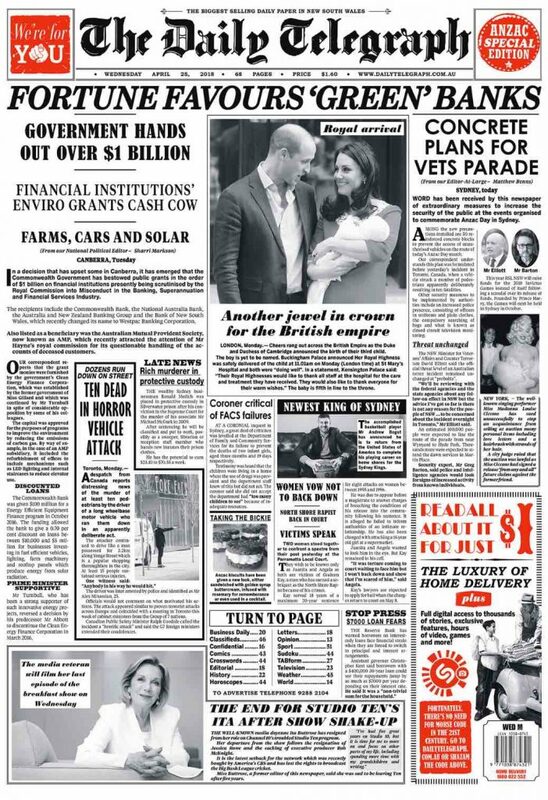 The black and white page one featured something like 13 separate stories with the three lead items covering Government green banks, the Anzac Day parade and the departure of the Duchess of Cambridge from hospital with her new son. The designers managed to fit eight different photos onto the page plus an ad and an index for the regular Daily Telegraph sections. 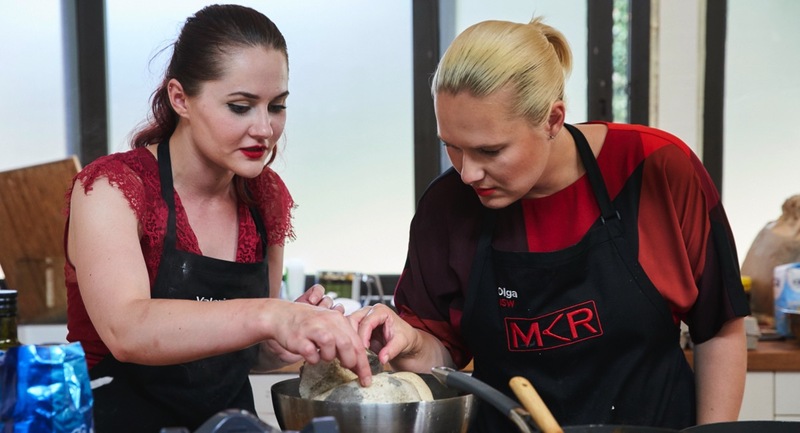 Network Ten has revealed the 10th season of MasterChef Australia will premiere on Monday May 7 at 7.30pm. After searching the far corners of the country for Australia’s best amateur cooks, the brave, confident and fearless will stand together, facing a massive judges audition process, which will leave only the very best 24 home cooks standing. 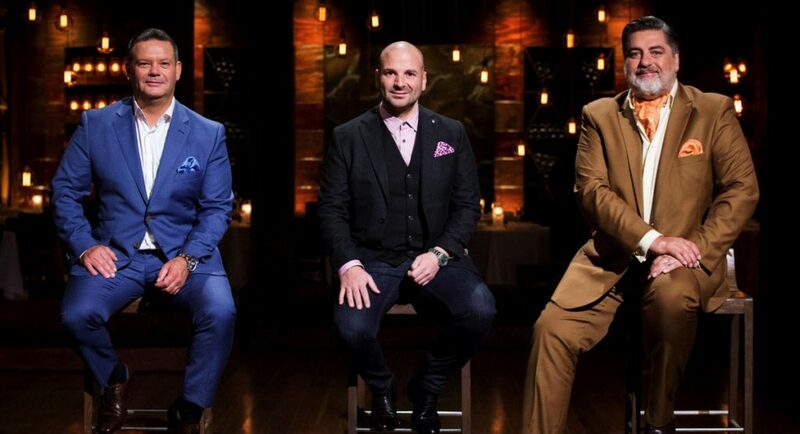 MasterChef Australia judges Matt Preston, Gary Mehigan and George Calombaris are back in the kitchen, encouraging and challenging the contestants to cook smarter, extend their creativity and overcome obstacles in ways they never dreamt possible. Vue de Monde’s Shannon Bennett reprises his role as mentor for the immunity challenges, confident he can give away more immunity pins than ever before. MasterChef Australia is promising a season full of surprises as it boasts some of Australia’s and the world’s best chefs including Maggie Beer, Curtis Stone, Adriano Zumbo and domestic goddess Nigella Lawson. For the first time, internationally renowned Michelin-starred chef Gordon Ramsay will enter the kitchen, keen to keep the top 24 contestants on their toes. Network Ten entertainment editor Angela Bishop and comedian Denise Scott are the top contenders to join the Studio 10 hosting panel after the departure of Ita Buttrose and Jessica Rowe, reports The Australian’s Dana McCauley. The pair are believed to be the frontrunners to join Sarah Harris, Denise Drysdale and Joe Hildebrand on the show, which farewelled Buttrose on Wednesday. Ten has had plenty of time to select the new recruits, with Buttrose confirming she gave notice more than seven weeks ago, before former co-host Jessica Rowe quit for “family reasons”. With Ten now under the ownership of the American network CBS, it would be easy to imagine a scenario in which Studio 10 is axed to make way for more of the cheap American content, by which it is already surrounded. But that is unlikely to happen, at least so long as the Australian government maintains its local content requirements (under which 55% of a network’s main channel offerings broadcast between 6am and midnight must be Australian). Change of some sort is quite possibly coming, but it’s unlikely to be in that area. 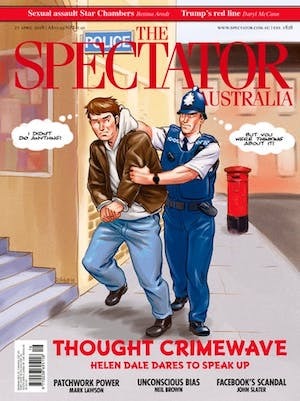 It’s Australian, and cheap, and it probably just got a whole lot cheaper. All of which suggests that whatever its current problems, chances are it will be here for a good while yet. 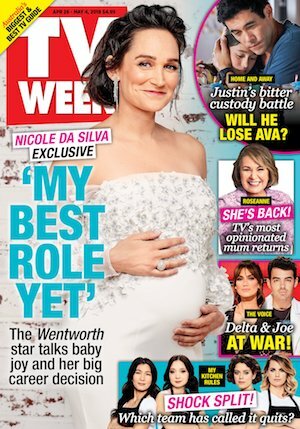 Chris Lilley is sure to fire up plenty of controversy when he launches his new TV comedy series currently shooting in Murwillumbah in northern NSW, reports News Corp’s Jonathon Moran. A Confidential operative sent in a snap from production that showed a local furniture store rebranded with the store name of “MyDick”. The new 10-part series is Lilley’s first TV project since 2014’s Jonah from Tonga, which was widely criticised for its patronising portrayal of Tongan culture and his use of brownface to play the character. 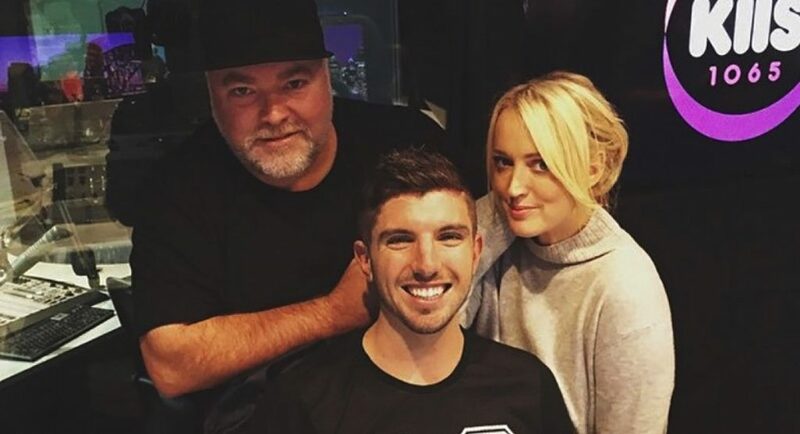 Jackie O gets a new co-host – who stepped up to replace Kyle Sandilands? KIIS 106.5 breakfast newsreader Brooklyn Ross stepped up to co-host Sydney’s #1 FM breakfast show this morning. Kyle Sandilands was away on the first day after recording the best-ever Kyle and Jackie O ratings result. 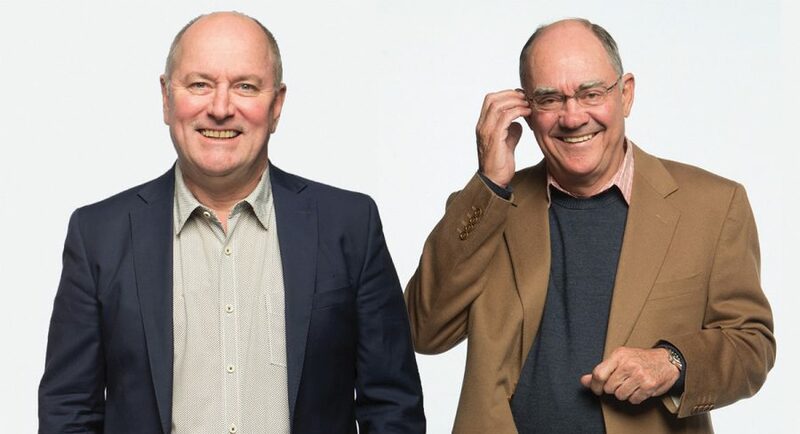 The breakfast show usually organises Beau Ryan to co-host with Jackie Henderson when Sandilands is away, but Ryan now has his own breakfast show, co-hosting the new Macquarie Sport Radio breakfast with John Stanley. “We miss Beau,” said Jackie this morning. 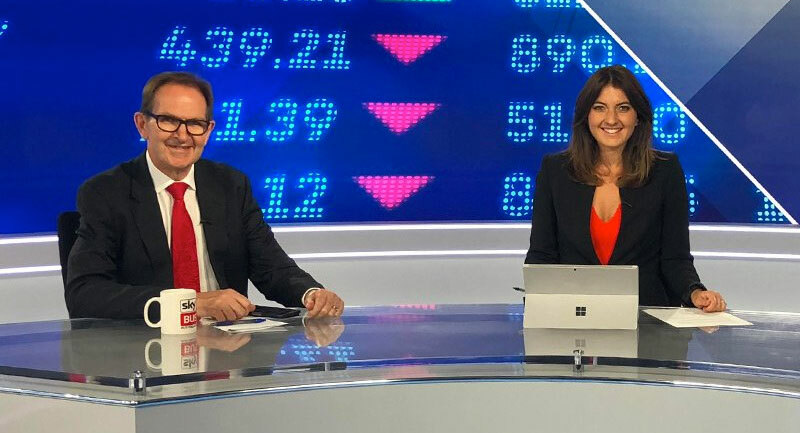 The K&J show executive producer Bruno Bouchet joined Jackie and Brooklyn on-air from 6.30am after his short early-morning segment reviewing the hottest stories of the day. The man who has lured global acts Beyoncé, Michael Jackson and Metallica to Sydney has revealed the perfect sales pitch that secured Andrew Bogut’s prized signature at the Kings, reports News Corp’s Matt Logue. Harvey Lister, chairman and chief executive AEG Ogden, which owns the Kings, is a 44-year veteran of the entertainment, sport and live theatre industries. Lister revealed Bogut’s Sydney deal includes the prospect of being involved in a host of business opportunities through AEG Ogden’s holding company called Sydney Arena Sports Investments. These post-basketball ventures could include ownership of other sporting franchises, hosting or owning eSports video game competitions or teams.